The noose seems to be tightening around former Mozambican finance minister Manuel Chang, who has been held in South Africa since late December under an international arrest warrant issued by the US. Chang, 63, was arrested at Johannesburg airport in connection with his alleged involvement in fraudulent loans to state firms totaling some $2 billion (€1.75 billion). The US alleges that Chang received $12 million to agree to sign a loan deal supposedly intended to finance a tuna-fishing fleet and maritime surveillance project. Chang had benefited from immunity as a serving member of parliament and extradition requests from both Mozambique and the US had gone unfulfilled. The request by the Mozambican attorney general's office for Chang's immunity to be lifted was granted this week. Chang is due to return to court in South Africa on Thursday to hear the outcome of his bail application. 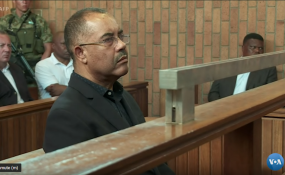 Another hearing is scheduled for February 5 to rule on Mozambique's extradition request. The Mozambican scandal has all the ingredients of a spectacular criminal case. Various state companies took out loans of some €1.8 billion from Credit Suisse and Russian investment bank VTB Capital, with Mozambique's government acting as a guarantor. Parliament should have given its approval -- but was not informed, and the money from the credits has disappeared. Mozambique cannot pay it back and is in deep trouble financially, also because international creditors have halted their payments. The credit was intended to pay for projects including the creation of a state fishing fleet. A company called Privinvest was to deliver coastal patrol boats for the navy and build a dockyard for their repair and maintenance. Behind Privinvest is Lebanese businessman Jean Boustani, who investigators say has taken bribes and bribed others to get orders for his company. According to British business risk intelligence agency Exx Africa, Privinvest and Jean Boustani have also been active in Angola, which has traditionally close ties to its fellow Lusophone country Mozambique. Both are former Portuguese colonies, after independence Marxist-oriented liberation movements -- MPLA (the People's Movement for the Liberation of Angola) and FRELIMO (the Mozambican Liberation Front) came to power. "MPLA and FRELIMO previously had a common enemy, colonialism. They fought and became a group of friends with similar interests," Mozambican analyst Severino Ngoenha told DW. "That led to a situation in which groups that had fought together for freedom could also turn into Mafia groups." Through Simportex, a state company owned by the defense ministry, Angola is said to have made a $495 million deal with Privinvest. New Angolan President Joao Lourenco was the defense minister at the time. Here too, the deal involved the purchase of patrol boats and a series of coastal protection measures. According to Exx Africa, the contract resembles in form and content one of the controversial deals made by Priminvest in Mozambique. Lourenco is said to have visited the project in Mozambique and had contact with Boustani.